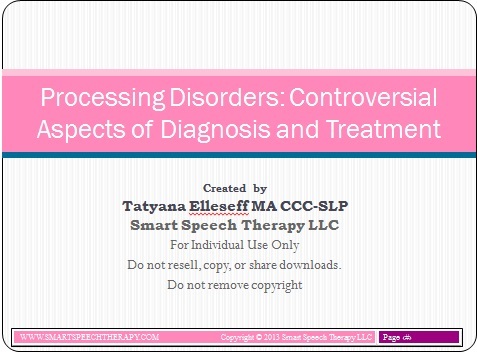 This 28-slide downloadable pdf presentation provides an introduction to processing disorders. It describes the diversity of ‘APD’ symptoms as well as explains the current controversies pertaining to the validity of the ‘APD’ diagnosis. It also discusses how the label “processing difficulties” often masks true language and learning deficits in students which require appropriate language and literacy assessment and targeted intervention services. *Please note that there’s an overlap between this material and Differential Assessment and Treatment of Processing Disorders in Speech-Language Pathology. Please review both product descriptions carefully prior to making a purchase of the desired material. What are SLPs to Do? Why Should SLPs Assess Students with ‘APD’? Regardless of whether you are a new or experienced SLP, if you work with children PK age through school-age, this packet is for you. It provides the most recent updates on current (C)APD practices approved by ASHA. My favorite parts of this presentation are the description of a child with (C)APD in the classroom setting, how they would perform on phonological awareness tasks, and how they would perform on language tests. Also this packet does note the number of other disorders that can look like (C)APD so it is imperative we as SLPs have an arsenal of information in order to make the appropriate referrals AND provide the most appropriate therapy even prior to an official diagnosis of (C)APD. Thanks Smart Speech Therapy! Great resource!